** Ranked #1 paid sports app in 36 nations. ** Draw, plan and create sports plays and tactics! CoachNote is more than just a fun app to use - it’s a powerful and useful tool for creating real sports drills, strategies and tactics. Not just for coaches, CoachNote is great for players, fans and sports enthusiasts looking to strategize and share their sports plays. With this simple yet incredibly versatile app, you can create, save and share complex sports tactics that translate effortlessly into real-life sports plays. - Create complex plays and strategies and watch them animate into beautiful and fluid motion. - A tool for drawing clean lines in multiple colors and styles - colored lines, dashed lines, arrow lines and arrow dashed lines. - Dropdown menu for selecting pen color and eraser. - A tool for erasing lines, plays, and players. - Create groups, assign and save players for future ease and convenience. - Input text that can be edited into various colors and sizes. Manage and control players’ movement, number, color and direction of rotation. 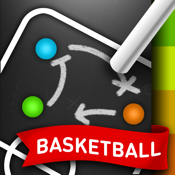 With CoachNote, you can even trace players and ball movement. Switching players is seamless and easy; you can set player direction and watch your plays come to life in a wonderfully animated motion. Use your finger to effortlessly create your plays on the multiple boards available. - Create, record and share a video of your plays with your voice. - Display your tactics on a TV/Projector with VGA Output (VGA Dock Connector required). - Convert your notes into a sharable pdf format for e-mail. - Synchronize the app for the iPad. - Beautifully animate your plays. - Use pictures of yourself as a court. - Player focused - automatically move your ball with a player. - Half court and Full court mode. - Clean the lines or players on the board. - Effortlessly change and switch player, player number or letters. - Multiple pages of notes available to fill in. - Formation preset to save and load all features. Want to see Coachnote in action? Check out this video and see what CoachNote is really capable of!